Comment: This Kashmiri sapphire is less ruby-like than the others. It is a very sleepy silky smooth color. 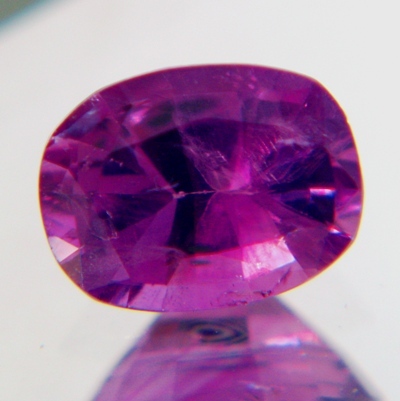 Individual hand cut with big single back facets, which produce a unique luster. Like all Kashmir sapphires we have seen this sapphire is very particular and needs time to be understood - no fast food gem but a collector item keeping its fascination for a long live. Please see big images in different light settings - special, even for Kashmir, very variable appearance at times, mark also the artifical light picture in the certificate. No inclusions visible to the eye. Big face - no window.